A consistently hilarious 90-minute chat that could have gone on for twice as long (or, ideally, a weekly television series) without ever feeling like too much of a good thing, “Tea With the Dames,” from director Roger Michell (“Notting Hill”), is as cozy and satisfying as its title suggests. Bracketed by theater-based vocal warm-up exercises, with all four women rapidly repeating chants such as “red lorry yellow lorry” (and a closing-credits attempt at a tongue twister that won’t be spoiled here), the conversation follows a loosely chronological trajectory — Atkins shares stories of her earliest years dancing with an institution known as The K.Y. School and her childhood confusion regarding why so many people found that name funny — and then digresses at random whenever one of the women remembers a particularly pointed anecdote. Memories of the 1960s ricochet between Dench and Atkins, the former announcing, “We swung early,” and the latter confirming, “You and I didn’t need the ’60s,” which segues into memories of protesting Vietnam in Trafalgar Square and watching Vanessa Redgrave get arrested. Stage nerves (“Fear is petrol,” states Dench), difficult men (notably Lord Laurence Olivier, Plowright’s late husband, of whom Smith says, “I was more nervous of your husband than the critics. Everybody was. We were terrified.”), raising children, remembering only the bad reviews, the female beauty standards of the entertainment business, the unique situation of being offered the title of “Dame,” and the challenges of film acting versus stage work all come in for dissection. All four are rankled by the subject of aging and death (Dench: “F–k off, Roger!”), quick to joke about “having three good eyes between” them, but somewhat aghast upon learning that fellow veteran actress Miriam Margolyes has already planned her funeral. There are, admittedly, cinematic limitations of a frame in which four people sit and talk, so Michell’s team curates a generous helping of archival footage. Home movies, personal photographs, and 50-year-old television clips — 1968 Dench in bright green body makeup for “A Midsummer Night’s Dream” is a sight to behold — make for thrilling punctuation to an already charming conversation. 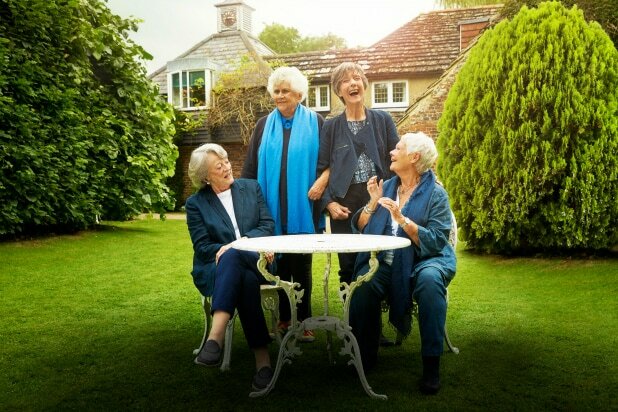 That charm, the vitality of “Tea With the Dames,” is a product of lifelong friendships and a relaxed comfort the four women share. Michell captures the actors in what may be a somewhat artificial environment, but one in which they speak more openly than we’re used to hearing — casually, but also truthfully, in a manner that tends to be tamped down in more formal interview or press-junket settings. We feel lucky to be eavesdropping, learning which one is most likely to self-deprecate (a toss-up between Dench and Atkins) and who’s the saltiest (Smith, but you probably guessed that already).